I enjoyed The Age of Innocence immensely and expected I would have the same response to The House of Mirth but never imagined I would become so emotionally involved in the story of Lily Bart I'd be tearfully proclaiming....I loved it!! "She was so evidently the victim of the civilisation which had produced her, that the links on her bracelet seemed like manacles chaining her to her fate." Lily was born into the wealthy upper class society of early 20th century New York and raised to be the perfect wife - a showcase to display her husband's wealth. Beautiful, much-desired and 'expensive' anything other than a life of luxury she has been taught to believe is 'dinginess' and 'living like a pig'. Unfortunately, at 29 , ' eleven years of late hours and indefatigable dancing' have taken their toll and Lily still lacks the two things necessary to social success - money and a husband. Lily is poor and depends on the generosity, and the hope of an inheritance, from the aunt she lives with. She will not marry for love without money but an inner resistance to society rules has her running away from numerous marriage proposals and her overspending trying to keep up with rich 'friends' eventually leads to a downward spiral of debt and dishonour. Lily Bart must surely be the most frustrating character I've ever met. The first chapter gives a glimpse of a young woman very different to the materialistic, shallow socialite she appears to be which immediately arouses sympathy and the hope that Lily will wake up and see the potential for happiness that is right before her eyes. At the same time somehow you feel the inevitability of it not happening - Lily can't make the right choices because she doesn't really know what she wants and so allows her fear of poverty to dominate her thinking and never takes the time to explore her deeper feelings and realise she only wants to be loved. 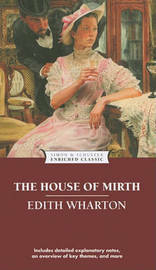 I loved Edith Wharton's writing, her imagery and symbolism and even though The House of Mirth is a walk on the dark side of Gilded Age New York society I didn't find it depressing , just very, very sad. This was my first Wharton; I read it for a book club about a year ago and was amazed by how much I enjoyed it. Her writing is exceptional. I keep meaning to go back and read some more, but haven't yet got round to it. Is 'The Age of Innocence' a good step forward? I'm probably not the right person to ask as I've only read the two mentioned. I'm going to read Ethan Frome next but I'm sure you'd enjoy Innocence. I adored this one! It was so heartbreaking, but just beautifully written. It certainly was and I know it will always be a favourite. EW's books aren't that long but I do recommend. I loved this one and The Age of Innocence was also very good. This is one of my favorite books and introduced me to a writer who I've never considered reading before. The movie with Gillian Anderson in it was actually pretty decent, and fairly faithful to the tale. I do need to read this book again and I need to pick up The Age of Innocence as well. I'm looking forward to reading more of her work. I didn't get so emotionally involved with The Age of Innocence but it was still very good and I'm sure you'll enjoy it.